Finished bookmark measures approximately 8¼ in. long × 1½ in. wide, not including ribbon. Notes: Bookmark is worked in joined rounds with right side facing. 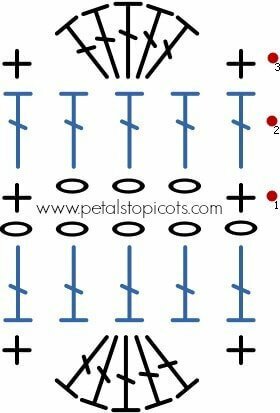 Round 1: Work 1 sc in 7th ch from hook, *ch 3, skip next 3 ch, 1 sc in next ch, rep from * 12 more times, ch 3, skip next 3 ch, slip st in last ch — 14 sc and 15 ch-sps. Round 2: Ch 3 (counts as dc), work 5 dc in ch-sp below rotating piece to work along opposite side of beginning ch, 1 dc in next sc, *3 dc in next ch-sp, 1 dc in next sc, rep from * 12 more times, 11 dc in last ch sp rotating piece to work along opposite side again, 1 dc in next sc, **3 dc in next ch-sp, 1 dc in next sc, rep from ** 12 more times, work 5 dc in last ch-sp, join in top of beginning ch 3 — 128 sts. Round 3: Ch 3 (counts as dc), work 4 dc in same st as join, skip next st, 1 sc in next st, skip next st, *5 dc in next st, skip next st, 1 sc in next st, skip next st, rep from * around piece, join in top of beginning ch 3 — 192 sts. Fasten off, weave in ends. Block if desired (see my post How to Block Knit and Crochet Items). Cut a piece of ribbon approximately 26 in. length. 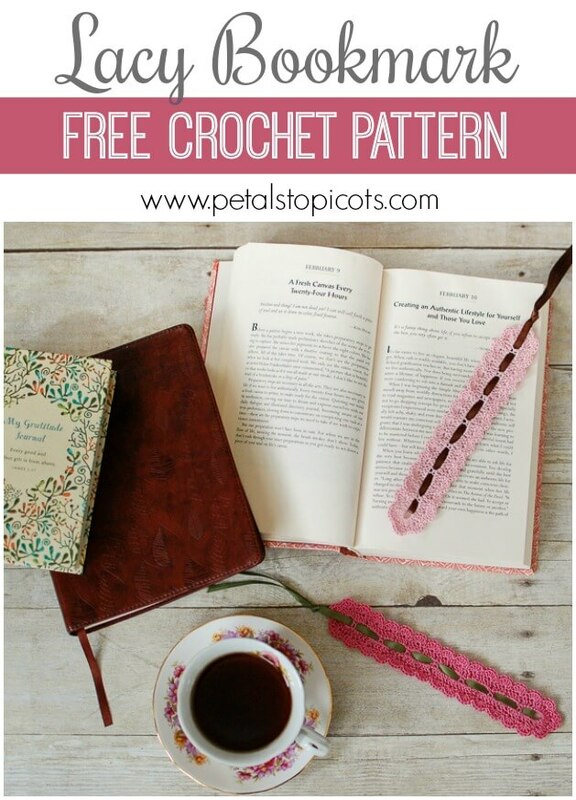 Insert one end of the ribbon underneath the first single crochet on one end of the bookmark, leaving equal lengths on both sides. Fold ribbon in half so ends meet. 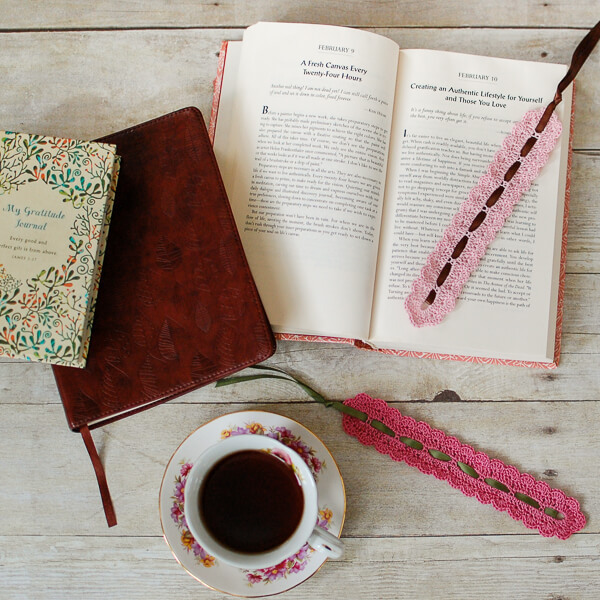 Holding the ends together, weave ribbon over and under the single crochets across bookmark as shown below. When you reach the end, separate ribbon again so one end goes over the top and the other goes underneath the bookmark, make a knot and snip to desired length. Previous Post: « Hookin On Hump Day #88: Link Party for the Fiber Arts! Looking for a cross pattern …..
I’m looking for the March dishcloth. Is it ready yet? Was the shell edging added to this pattern? I don’t see it in the instructions. I just made this bookmark & gave it to my friend for her birthday, she loved it! This is such a beautiful bookmark. I’m hoping someone can help me though. I’d like to make another that’s about 2″ shorter but cannot figure out the counts. I’m a self taught relatively new crocheter so if anyone could help me I would greatly appreciate it! I think it you shorten the chain and omit one of the shell repeats it should be about and inch or so shorter. I would have to sit down and experiment with the pattern. My granddaughter is having a birthday party this coming weekend and my DIL is going to give out crocheted items I’m making instead of toys. I found your bookmark browsing for headbands and I think I’m repurposing it for one! I think it’s going to look REALLY cute in a little girl’s hair! Thanks SO much for posting the pattern! Love this bookmark! Now to figure out how to make it from the pattern. I am new to much in the crochet world. Have a super great crocheting day! I found this post through a page I follow on Facebook (Flamingo Toes). This is such a cute idea. My neighborhood is starting a book club and I would love to make this for them. Thank you for sharing this project and pattern!